NEW WILMINGTON, PA – Dr. Karen Resendes, associate professor of biology at Westminster College, was recently highlighted in ASBMB Today magazine. NEW WILMINGTON, PA – Olivia Sniezek, a 2018 Westminster molecular biology graduate, and Madison Gallucci, a 2018 Westminster biology graduate, were each awarded first place in their respective poster sessions at the 2018 National Biological Honor Society (TriBeta) Undergraduate Symposium held May 30 to June 3 at California State University in Monterey Bay, Calif. In 2014, officials announced that Westminster College was set to receive a $1.027 million grant through the Robert Noyce Teacher Scholarship Program of the National Science Foundation, a program aimed to increase qualifications of secondary educators in science, technology, engineering and mathematics (or IQ:STEM). Since its inception at Westminster, seven scholars have been accepted into the program; four of which have graduated and are in their first years of teaching. The Barry Goldwater Scholarship and Excellence in Education Foundation has announced 240 new Goldwater Scholars and identified 307 students as Honorable Mentions. For 30 years, Goldwater Scholarships have been awarded to thousands of undergraduates pursuing careers in STEM research. Westminster College honors students Tyler Heintz ’18 and Audrey Nickle ’18 were granted Honorable Mention status in the 2017 Goldwater Scholarship competition. Dr. Karen K. Resendes, associate professor of biology and coordinator of the molecular biology program, and a team of eight past and present Westminster College biology and molecular biology majors have published their cancer biology research entitled “5-Flurouracil disrupts nuclear export and nuclear pore permeability in a calcium dependent manner" in the journal Apoptosis: An International Journal on Programmed Cell Death. As part of the NSF Robert J. Noyce Scholarship Grant, Westminster College will host an IQ-STEM workshop, June 20 – 24, featuring nationally recognized urban educator, Dr. H. Richard Milner IV. The event is open to student fellows and area STEM partner high school teachers. 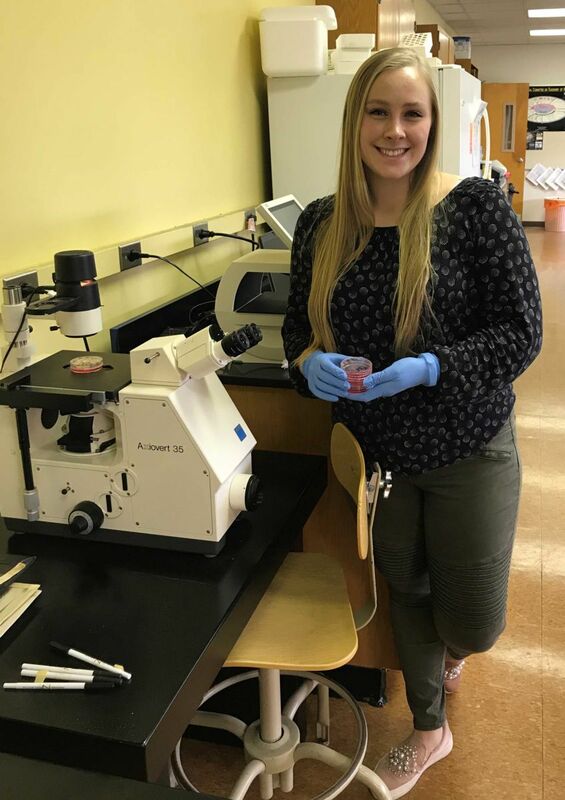 A Westminster College class of 2016 graduate, Kelly Higby, has been selected to present her undergraduate honors research at St. Jude Children’s Research Hospital in Memphis, Tenn. this July. What can you do with a Molecular Biology degree? Imagine yourself a medical doctor, researcher, pharmacuetical scientist, or epidemiologist.